Officials with Houston’s oldest Hare Krishna temple are asking the vandals who stole two sacred statues from the house of worship this week to return them, promising no questions will be asked. The thieves probably stole the deities from the ISKCON of Houston Temple at 1320 W. 34th St. because they mistakenly thought the statues were made of gold, but they are made of brass, said Chirag Bhatt, a spokesman for the temple. The crime, worshippers said, would be akin to stealing a crucifix from a Roman Catholic church. A $5,000 reward is being offered for the deities’ return. The burglary happened between 9:15 p.m. Wednesday and 4:30 a.m. Thursday when the intruders broke in through the temple’s locked back door. The temple’s alarm system was not activated because of ongoing construction at the building. 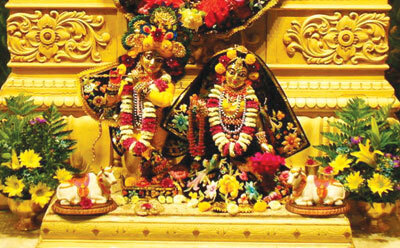 The deities, which weigh about 15 to 20 pounds and are about 18 to 24 inches long, are known as Sri Sri Radha Giridhari. They have been worshipped by thousands of Hindus in Houston. Worshippers revere them as personalities because the deities are invited to be present in the temple as a gesture of accepting the congregation’s devotional services. The intruders also tried to take other deities that were apparently too heavy for them to lift, Bhatt said. Houston police have alerted pawn shops and businesses that purchase brass objects to be on the lookout for the items. Bhatt asked the thieves to return them, suggesting they could anonymously drop the statues off at the temple in the middle of the night. Worship services will continue at the ISKCON of Houston Temple, which is the oldest of its kind in the city. The temple originally opened in 1969 in downtown Houston at 1111 Rosalie. It moved to its current location on West 34th Street in 1984. More than 100,000 Hindus are in Houston, said Vijay Pallod, a spokesman for Hindus of Greater Houston.